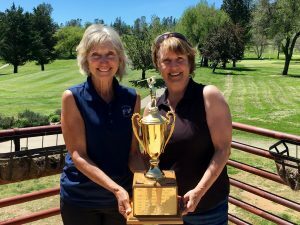 Congratulations to Sandy Hansen & Cathy Fouyer, our 2017 Memorial Tournament Champions for the 18-hole Ladies Group. In the 36-hole “Eclectic Format”, this twosome improved their first week score of 69 to end up with a Net 63 as a Final Score, and a 3 stroke victory. Three teams finished with Net 66’s, but using the tie-breaker formula, the team of Chris Elko & Marlene Dresbach claimed 2nd place, followed by Donna Roach & Natalie Atkinson in 3rd.